After years of paying a separate entity to pick up and dump its recyclable materials, Brian-Kyles Landscapes of Distinction in Lorain, Ohio, came up with a better solution: cut out the middle man. Now a Class 4 U.S. Environmental Protection Agency (EPA) composting facility, Brian-Kyles saves 3-5 percent annually by recycling its own sod clippings, leaves and bed edges into bed mix and topsoil. 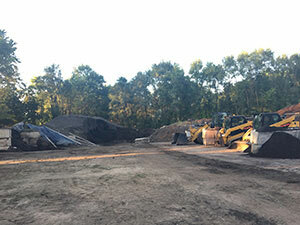 “The recycled material makes the topsoil really rich and vibrant,” said James Hopkins, production manager of Brian-Kyles. The company began the practice in 2010 after a local municipality requested to dump recyclable materials at Brian-Kyles’ facility, according to Brian Maurer, president of Brian-Kyles. Class 4 U.S. EPA composting facility. Years later, he still allows municipalities to dump compostable material for free. The company charges individual entities a flat rate to cover the cost of producing the material to be market-ready. It later discounts their purchase of the finished product. The composting process typically takes about two years. After the recycled material is moved to the back of the compost pile, it’s flipped monthly, screened for matter that’s indecomposable and left to settle for another six months to a year. While the procedure takes some time, Hopkins says it’s worth it when it comes down to the savings on man-hours, fuel and money spent on outsourced topsoil, not to mention the environmental benefits. “We are keeping our material green and making sure that it is fully our product that we are laying down,” said Hopkins.